Gambrills, Maryland is considered one of the best places to live in the state. It’s a peaceful and quiet village conveniently located between Baltimore and Washington, DC. 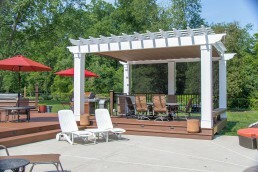 Keen on spending more time outdoors, these homeowners contracted Sommerscapes Inc. to design a wraparound deck and step-down porch. 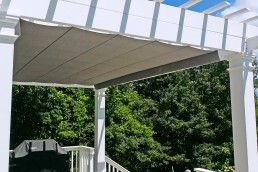 The outdoor extension includes a modest white fence bordering the deck with enough space to comfortably barbecue and dine. Although the elevated walk out deck provides picturesque views of the surrounding landscape, the afternoon sun made it tough to enjoy. 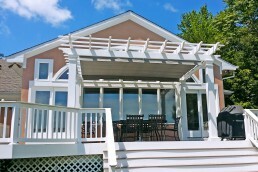 To combat the intense sunshine, a pergola was constructed over the main entertainment area. 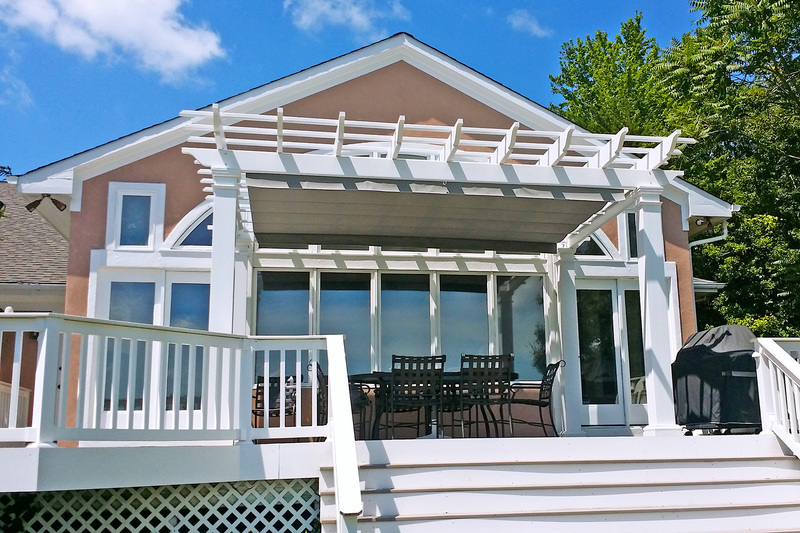 With proper planning and post height consideration, the pergola was designed to blend with the existing trim of the house. However, with rafters spaced 12 inches apart, the sun’s ray still found their way through the structure with relative ease. 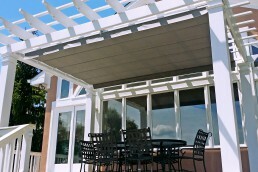 As a result, Sommerscapes Inc. engaged ShadeFX to incorporate a retractable shade for the pergola. 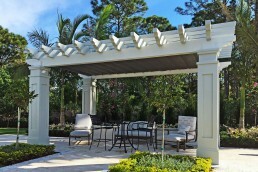 The 10’ x 14’ manually operated canopy is crafted using a Harbor Time Shale fabric. 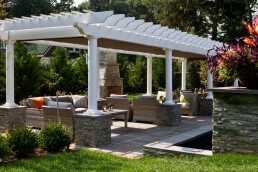 – Kevin Sommers, Owner, Sommerscapes, Inc.
After an eventful day in the city, these homeowners retreat to their quiet neighborhood to relax and enjoy a barbecued dinner either in the warmth of the sun or under the cooling of the shade. 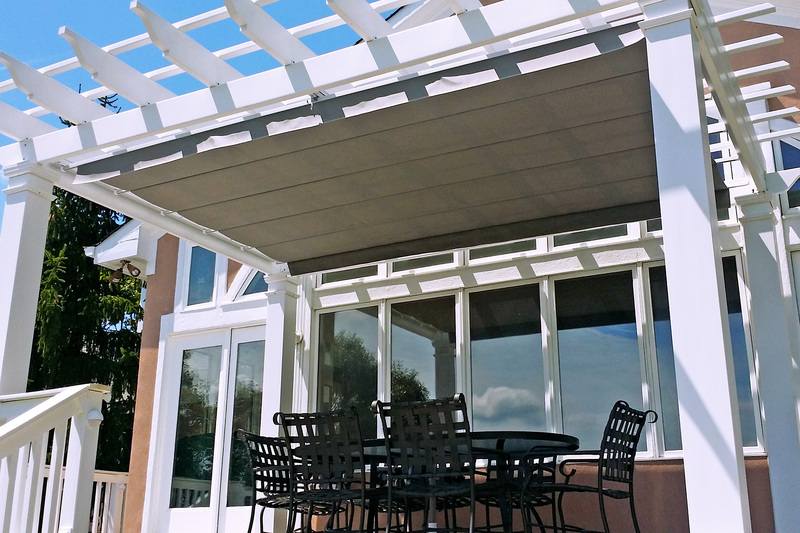 Need a retractable shade cover? We can help. 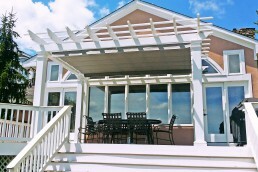 Battling the afternoon sun, Sommerscapes Inc. built a pergola on the main deck. 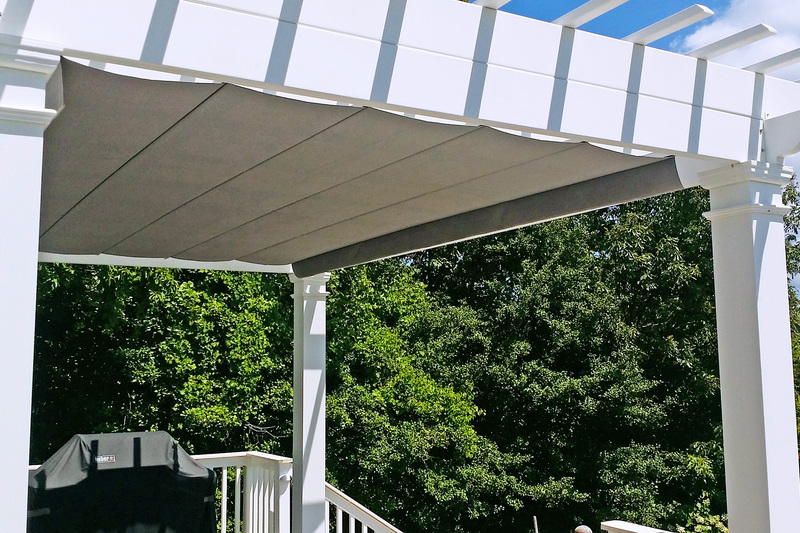 As the sun’s ray’s still found their way through the white frame, ShadeFX customized a 10’ x 14’ retractable canopy for complete protection.